Brutally cold conditions have prompted wind chill warnings from Virginia to Vermont as frigid temperature are expected to envelop the East Coast most of this weekend. CBS News has confirmed that at least 22 people nationwide have died from the recent blast of winter weather and cold temperatures. A storm began days ago in the Gulf of Mexico and first struck the Florida Panhandle. By Thursday, it was wreaking havoc as blizzard warnings and states of emergency went into effect along the Eastern Seaboard. Wind gusts hit more than 70 mph in places and some areas saw as much as 18 inches of snow. In the South, Tallahassee, Florida, saw snow and residents of southeast Georgia were treated to a rare half-foot of snow. In New England, the powerful winds brought coastal flooding that reached historic levels in some communities with icy water overflowing piers, streets and restaurants and stranding some people who had to be rescued. Follow along with updates below as the storm works its way up the coast. All times Eastern unless otherwise indicated. Forecasters have issued a new winter weather advisory for metro Atlanta, warning of the chance for light freezing rain Monday morning - hours before college football's national championship game in Atlanta. The National Weather Service says light freezing rain is expected to develop very late Sunday night into Monday morning. Forecasters say less than a tenth of an inch of ice is expected, but that it's enough to make travel treacherous during Monday morning's commute. Traffic is expected to be heavy in Atlanta on Monday with the big game and a visit from President Donald Trump, who plans to attend. The University of Georgia and the University of Alabama face each other in the College Football Playoff National Championship Monday night. Georgia road crews on Sunday had already begun pre-treating interstates and highways. The bitter cold that followed a massive East Coast snowstorm should begin to lessen as temperatures inch up and climb past freezing next week, weather forecasters said. Patrick Burke, a meteorologist with the National Weather Service's Weather Prediction Center in College Park, Maryland, said temperatures Sunday morning could hit record lows from South Carolina to Maine. But he said the wind won't be as punishing as it was on Friday and Saturday. "With the wind dying down it will probably feel significantly better although many of these areas will still be below freezing," Burke said. An unlikely sight at Central Florida as hundreds of dead fish have washed ashore because of the cold weather snap, according to CBS affiliate WKMG-TV. Officials say most of the fish washed up near New Smyrna Beach on Friday and a bit more Saturday. 9:55 p.m.: Look at FlightAware's "Misery Map"
CBS News takes a look at the Misery Map provided by FlightAware. Current data spans between 7 p.m. and 11 p.m. According to FlightAware, there are a total of 392 flight delays and 21 cancellations across the U.S.
New York City tops the list with 99 delays and four cancellations as of Saturday night. Chicago is next up with 48 delays and three cancellations, according to FlightAware. Jaw-clenching temperatures to start the weekend throughout the Northeast hit Burlington, Vermont, at minus 1 and a wind chill of minus 30. Both Philadelphia and New York were shivering at 8 degrees. And in Hartford, Connecticut, a brutal cold of 10 degrees yielded a wind chill of minus 20. Boston, at a relatively balmy 11 degrees, was wrangling with a different kind of challenge: a shortage of plumbers as the weather wreaked havoc on pipes that froze and cracked, Democratic Mayor Marty Walsh reported. In New Jersey, many people stayed home instead of dealing with single-digit temperatures. Others were cleaning up from the storm that dropped more than a foot of snow in some spots earlier in the week. "My car felt like an icebox this morning, even though I had the heat on full blast," Julie Williams said as she sipped coffee inside a Jackson Township convenience store. She was headed to work at a local supermarket, and was expecting it to be packed. "People think it's nuts before a storm happens, with everyone getting milk, bread, etc." she said, adding with a laugh, "but it's even worse in the days afterward, because they do the same thing but they're a little crazy from cabin fever." Travelers at New York City's John F. Kennedy Airport are experiencing lengthy delays after this week's winter storm. Some say they've been waiting to travel for more than 20 hours, CBS New York reports. The Port Authority of New York and New Jersey, which runs the airport, said it was working with airlines and the Federal Aviation Administration to limit flights into JFK on Saturday "until there are adequate gates available to handle the backlog of flights due to recovery of flight schedules in the wake of Thursday's storm." 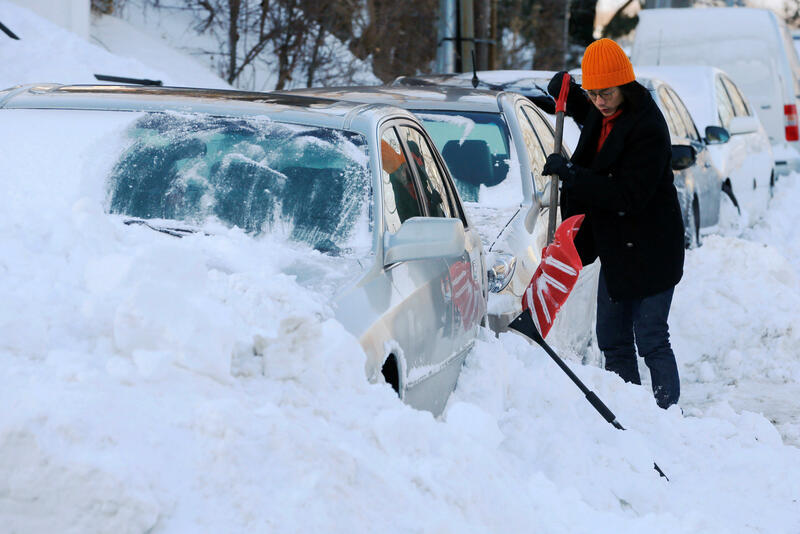 It's been days since a blizzard stormed through New England, but some drivers still haven't cleared snow and ice from their vehicles, CBS Boston reports. The Bridgewater Police Department shared a photo with at least a foot of snow across its roof and reminded drivers that officers issue $40 fines for theses dangerous violations. Police in Bedford, New Hampshire, said a car windshield was shattered due a driver who didn't remove snow and ice. A 17-year-old was driving on the highway near Manchester when a piece of snow and ice flew off another driver's car and landed on his windshield. "I am sure that most of us have had some near misses (at the very least) and that was enough to scare the living daylights out of us. It is the law, folks!," police said on Facebook. Many New Jersey residents chose to stay home instead of dealing with single-digit temperatures. Others were cleaning up from the storm that dropped more than a foot of snow in some spots earlier in the week. "My car felt like an icebox this morning, even though I had the heat on full blast," Julie Williams said as she sipped coffee inside a Jackson Township convenience store. She was headed to work at a local supermarket, and was expecting the store to be packed. In Rhode Island, hospitals were treating dozens of storm-related injuries as the region grits through a deep freeze that followed a powerful blizzard. In Providence and Newport, at least 40 people were treated for various weather-related conditions, from heart attacks, snowblower or shoveling injuries, motor vehicle accidents, frostbite, hypothermia and injuries including slips and falls, according to The Providence Journal. The storm dropped more than 14 inches of snow in Providence. Summit conditions at Mount Washington were so brutally cold Saturday morning the temperature tied for the second coldest on Earth, according to Mount Washington Observatory. The temperature hit minus 36 degrees Fahrenheit -- with a wind chill of minus 90 degrees (minus 68 degrees Celsius), according to the educational and research institution in New Hampshire. Temperatures were in the single digits from Philadelphia to Boston on Saturday morning and expected to fall closer to zero Saturday night, with wind chills making it feel like minus 10 degrees to minus 20 degrees. In Burlington, Vermont, the temperature was minus 1 Saturday morning, with a wind chill of minus 30. It was 8 degrees in Philadelphia and New York City, with wind chills ranging from minus 9 to minus 11. The National Weather Service said Friday that temperatures in the Berkshire mountains in western Massachusetts could seem like a frosty minus 35 degrees, parts of New Hampshire and Maine could experience minus 45, and Vermont's mountain regions could feel like minus 50 degrees. The weather service issued wind chill warnings for various days this weekend for parts of Vermont, New York, Virginia, West Virginia, Maryland, Maine and New Hampshire. These locations, however, will have nothing on the White Mountains in New Hampshire. The Mount Washington Observatory, on its website, predicted the mountain's highest summits could see wind chills of minus 100 degrees into Saturday. CBS New York reports on a story about a family who returned Friday after what they called a nightmare aboard the Norwegian Breakaway. For 21 members of the Ross family of Stony Brook, it was supposed to be the trip of a lifetime, cruising to the Bahamas for their patriarch's 80th birthday. "I thought I'd never be in a situation where I would say that's the scariest moment of my life. This was the worst moment of my life," Karoline Ross told CBS New York. Ross says their 4,000 passenger cruise ship sailed into the storm Tuesday night for two harrowing days in 20 to 30 foot ocean swells. The seasoned boaters called it traumatic. CBS Boston reports that residents in Winthrop, Massachusetts, are spending another night in the cold as the storm wreaked havoc on seaside neighborhoods. Winthrop Fire Captain Scott Wiley said crews responded to at least 150 calls in the last 24 hours for flooded basements, problems with smoke alarms and odors and heating issues. They've been pumping basements around the clock in neighborhoods like Pico Avenue where Sean Driscoll's basement flooded and three cars were damaged. He managed to get his family to a hotel but now has no heat, electricity or water. "I was a kid during the blizzard of 78 and this was definitely close to that," he said. "If I didn't get out of the basement when I did, when water passed the electrical panel, I could have been electrocuted," Esposito said. "I'm lucky I got out before that." He says the bucket rescue was a hair-raising experience, but he was grateful for the lift. "The only bad thing was the metal blade was so slippery with and snow it was hard to keep yourself steady," he said. Lt. Governor Karyn Polito met with Winthrop town officials to tour the hard hit area and assess the damage. She is hoping for some federal disaster relief. "We will evaluate all the estimates and then determine what next steps can be taken," Polito said. Public schools were closed in Baltimore on Friday, but it wasn't a snow day. The schools have been dealing with flooding and heating issues blamed on decades of neglect and mismanagement. Outraged by the state of Frederick Douglass High School, teacher Kiragu Beauttah posted videos of buckled floors and burst pipes on Facebook, CBS News' Errol Barnett reports. "It was almost as cold in there as it is out here right now," Beauttah said in one video. "It flooded the first day and I moved to another class, then that class flooded." Since 2009, the school system has returned roughly $66 million in state funding for repairs. According to the Baltimore Sun, that's because contracts didn't comply with regulations. But the schools told CBS news that's "misleading" and say specific requests for school heating systems, including one for Frederick Douglass High School, were deferred by the state. One new practice stemming from all this will be an early morning temperature check at each Baltimore school, so decisions to close can be made on an individual basis rather than at the district level. CBS Boston reports that the parking lot at Gloucester High School in Massachusetts was a car graveyard thanks to the storm surge that buried dozens vehicles during Thursday's high tide. The cars are now a total loss. "I feel like crying, I have no car," Bonnie O'Lando told the station. Folks spent Friday trying to salvage whatever they can. Chris Bowers and Kyra Limberakis plan to marry this April and their gift list will need to include a new car. Their vehicle was flooded up to the roof. "My family is from Louisiana so flooding is not foreign but we just we never thought it would happen here," Bowers said. City officials had asked residents to park their cars in the lot while the parking ban was in effect. "It's an unfortunate situation. We've never had a storm surge like this in the city. This parking lot was flooded. They can't be salvaged. They were all under water and floating," Gloucester Chief Administrator Jim Destino said. Limberakis said she's frustrated over the loss of her car. "We had no idea there was no other place to park. This is where we were told to park and then they got flooded," she said. Residents now hope their insurance will cover the cost like the storm covered their cars. Maine authorities are searching for a clammer who disappeared during the blizzard. The man was reported missing around 11 p.m. Thursday. The U.S. Coast Guard says the family of 35-year-old Paul Brenner said he had departed from St. George at 5 p.m. Thursday to clam on Clark Island. The Coast Guard says Brenner was reported to be in a 16-foot skiff that matches the description of an unmanned skiff found near Long Cove on Thursday night. The Maine Marine Patrol and local authorities are searching the area by water, foot and air. St. George is a coastal area about 46 miles southeast of Augusta. Seas are about 3 feet, and the water temperature is about 37 degrees. CBS News has confirmed that at least 22 people nationwide have died from the recent blast of winter weather and accompanying cold temperatures. The deaths include a Wisconsin man reported missing last month and a Massachusetts state worker. In western Wisconsin, the Barron County Sheriff's Department said deputies on Wednesday were rechecking an area where Joseph Moen was last seen and discovered his body. The 49-year-old Chetek man was reported missing Dec. 27. Officials say the initial cause of death appears to be exposure to the cold, but other factors could also have contributed to his death. Outside Boston, in Arlington, Massachusetts, a state Water Resources Authority worker collapsed into a snowbank while shoveling snow and ice and died. Authorities say a girl struck by a pickup truck while sledding and a 75-year-old man hit by a snow plow while clearing business parking lots have died in Virginia in the aftermath of the snowstorm. Police in Chesterfield County, a suburb of Richmond, Virginia, say the girl was sledding down a driveway when she slid into a road and was hit by the pickup truck Thursday. Police say in a statement that the driver immediately stopped and that the girl was taken to a hospital where she died of her injuries. The girl wasn't immediately identified. In the greater Hampton area of southeast Virginia, authorities told The Virginia-Pilot that a 75-year-old private contractor, Barry Hale, was hit by the plow shortly after midday Thursday while clearing snow from parking lots in Buckroe. He died at a local hospital of his injuries. A police statement says the Virginia Department of Labor will conduct a follow-up investigation. CBS News has confirmed that at least 19 people nationwide have died from the blast of winter weather and accompanying cold temperatures. CBS Boston has sent a helicopter above coastal communities in Massachusetts to survey storm damage. You can watch the footage in the player above. Frigid weather is causing water pipes to burst underground in Mississippi's largest city. The entire city of Jackson was put under a precautionary boil-water notice Thursday because of pressure problems. Portable toilets were placed outside the state Capitol, where legislators are meeting. Some restrooms in the four-story building were blocked off because toilets wouldn't flush. Temperatures in Mississippi have been at or below freezing for several days. As of late Friday morning, nearly 1,200 domestic or international flights involving the U.S. have been canceled, according to tracking website FlightAware.com. On Thursday, nearly 4,400 flights were canceled. FlightAware expected cancellations to continue through the morning at most Northeast airports as aircraft and crews are repositioned. Authorities say a 64-year-old Ohio man whose body was found on the front porch of his home by a meal delivery driver froze to death. The Akron Beacon Journal reports the Summit County Medical Examiner's Office on Thursday confirmed that Darnell Wilson, of Akron, died of hypothermia. His body was found Tuesday by a woman delivering food for the Mobile Meals program. The high temperature in Akron reached just 14 degrees that day. It's unclear how long Wilson had been on the partially enclosed porch before his body was found. The storm dumped more than a foot of snow in parts of Maine, CBS News correspondent Jericka Duncan reports from Saco, south of Portland. Along the coast, powerful winds led to some of the worst tidal flooding in four decades. Over the last decade, Sean Walker has seen how an eroding coastline in Saco threatens homes. "My childhood memories are being washed away," Walker said. On Thursday, he watched the storm pound the area once again. "What's kind of going through your mind?" Duncan asked Walker. "Cross your fingers," he said. "Really, cross your fingers and hope for the best." The storm's coastal flooding in New England reached levels not seen since the Blizzard of 1978, CBS News correspondent Don Dahler reports from Boston. When floodwaters receded, the plummeting temperatures turned any left behind into ice. The record flooding was caused by a disastrous mix of events. The storm hit during high tide, which was intensified by Monday's supermoon. "It was just coming down, and it was like up to my waist," said Jennifer Cametti of Marshfield, Massachusetts. "I couldn't get back." The National Guard used high-water trucks and even a bucket loader to rescue families stranded in their homes. "It was scary, and I wanted to get out," said Nicole Cametti. "They came up to the front door and they- like he put me over his shoulders and put me in the car." Flights suspended at John F. Kennedy International Airport because of Thursday's massive snowstorm resumed Friday. Flights were suspended at JFK due to strong winds and whiteout conditions. Air traffic suspensions at LaGuardia Airport have been lifted, but authorities advise passengers to contact their airlines regarding specific flights. The flight-tracking site FlightAware reports nearly 5,000 canceled flights across the United States. Those flights include more than two-thirds of flights in and out of New York City and Boston airports. Utility companies across the East reported some 21,000 homes and businesses had no electricity in the wake of the storm early Friday, down from almost 80,000 the day before, as crews fanned out to fix downed power lines and other problems, according to the Reuters news agency. CBS News has confirmed 19 deaths from the huge storm and bone-chilling cold. Among them: several from traffic accidents, a body found on the shore of Lake Winnebago in Fond du Lac County, Wisconsin -- a death attributed to exposure -- and a man Greenup County, Kentucky who had no heat or electricity in the camper he was found in. 2:45 a.m.: "Chilly, chilly stuff"
The Arctic blast forecast to hit much of the upper-East Coast this weekend could make temperatures feel as low as minus-15 degrees from Philadelphia to Boston Friday and make residents of states such as Maryland and Virginia shiver from temperatures ranging from 10- to 15 degrees. "This is chilly, chilly stuff," Brian Hurley, a meteorologist with the National Weather Service's Weather Prediction Center in College Park, Maryland, said Thursday. Coastal areas in the Northeast, Hurley said, may experience numbing single digits. he South won't be spared, either. Louisiana, Mississippi, Alabama and Georgia can expect temperatures around 15 degrees to 20 degrees, Hurley said. Northern Florida will be in the 20s to low 30s. Sunday morning should bring the coldest temperatures from Portland, Maine, to Washington, D.C. "That's when you'll see records being challenged or broken, with temperatures at or near zero in many places," Hurley said. More seasonable weather is expected to return early next week with temperatures in the high 30s and near 40s, he said. For some, it will feel downright balmy. CBS News checks in with the online Misery Map from FlightAware that shows flight delays and cancellations across the country. CBS News weather producer David Parkinson writes that the snow is done in New York and will be wrapping in the Boston area over the next few hours. With the exception of downeast Maine, the heavy snow is all done. The worst of the wind is also done. However, wind gusts will stick around overnight as the bone chilling temperatures move in. Going forward, the temperature will just keep plunging. The high in Boston on Saturday is in the low single digits. It's 9 in NYC. The overnight low is around 0 in NYC and -10 in Boston Sunday morning. In terms of wind chills, temperatures won't be above zero for 48 hours in NYC. In Pittsburgh, it's closer to three days. New York's JFK Airport tweeted Wednesday that flights are scheduled to resume at 7 a.m. ET on Fri., Jan. 5. The airport urges customers to check with their specific airliner for more details. Earlier, JFK suspended flights Thursday because of the strong winds and blowing snow. LaGuardia Airport tweeted Wednesday night that flight suspensions have been lifted. Flight suspensions have been lifted at LGA Airport, but fliers are urged to contact their airlines for information on resumption of specific flights. Bone-chilling wind gusts of up to 50 mph made it difficult for residents to get around Portland, Maine, by car and foot. Twenty miles south of Portland, on Ferry Beach, the storm swallowed up foundations, CBS News correspondent Jericka Duncan reports. Resident Sean Walker was one of many who watched his childhood memories get washed away. Emergency management officials are bracing for a very long night. Snow fell heavily in downtown Boston, and winds blew so hard that plows couldn't keep up with the storm, CBS News correspondent Don Dahler reports. In Brant Rock, high winds sent frigid waters pouring high over the sea wall and into the streets. About 25 miles away, cars were washed away by the rising tide. Further up the coast, in Scituate, wind and waves turned ice into projectiles. Town manager Jim Boudreau described the weather conditions as "wild." And in New York, the storm was so fierce that 1,500 snow plows had trouble keeping the streets and highways clear of snow. A man driving a pickup truck home from work on an icy South Carolina interstate has slid off the roadway, hit some trees and been killed. Arther Cumbie Jr. is the state's first storm-related death from Wednesday's ice and snow. Kershaw County coroner David West says Cumbie was driving at or below the speed limit Wednesday afternoon when his truck left Interstate 20. He says witnesses tell investigators Cumbie's truck started sliding on the ice and snow and he lost control. West says Cumbie was wearing a seatbelt but died from head injuries. The massive storm roared into the East Coast on Thursday, dumping as much as 18 inches of snow from the Carolinas to Maine and unleashing hurricane-force winds. More than 100,000 customers lost power in the winter storm that's blanketed the East Coast with heavy snow and hurricane-force winds. In the New England states, Massachusetts was hit with more than 22,000 outages Thursday afternoon. Scattered power outages were reported in New Hampshire and Rhode Island. Maine reported 4,400 outages. About 6,300 customers lost power on Long Island on Thursday afternoon, but crews quickly restored more than 2,000 as of early Thursday evening. Virginia had a peak of 45,000 outages, with about half restored as of early Thursday afternoon. The Carolinas experienced about 30,000 outages at its peak on Wednesday. Forecasters expect the storm to be followed immediately by a blast of face-stinging cold air that could break records in more than two dozen cities this weekend. Airlines have now cancelled 4,020 flights nationwide due to the blizzard on the East Coast, CBS News transportation correspondent Kris Van Cleave reports. The storm has shut down several major airports, including John F. Kennedy International Airport until 8 p.m., LaGuardia Airport until 6 p.m. and Logan International Airport until 5:30 p.m., according to Van Cleave. Baltimore-Washington International Airport and Philadelphia International Airport both remain open, but are not accepting diversions at this time. Newark Liberty International Airport has one runway open; however, flights have not been able to land due to crosswinds and poor conditions for landing. In total, there have been 103 diversions from East Coast airports. Van Cleave reports 614 flights remain cancelled for Friday. Authorities say a person is dead after the car they were traveling in couldn't stop at the bottom of a steep, snow-covered hill and slammed into a commuter train on its way to Philadelphia. Police say the driver of the car was able to escape before the crash Thursday morning in Lower Moreland but the passenger stayed inside as the vehicle crashed through a gate at the railroad crossing. That person was later found by police along the tracks. A spokeswoman for the Southeastern Pennsylvania Transportation Authority says none of the passengers on board the West Trenton line train were injured. The train was about 20 miles north of downtown Philadelphia. It happened as the winter storm was blowing snow, icing up roads and causing traffic havoc around the region. CBS News has confirmed that at least 13 people nationwide have died from the blast of winter weather and accompanying cold temperatures. As of Thursday afternoon, over 3,600 flights have been canceled in the U.S., according to tracking website FlightAware.com. In New Jersey, Newark Liberty International Airport was the airport most affected by the storm. More than 930 flights, or 71 percent of the airport's traffic, were canceled. For Friday, more than 310 flights in the U.S. have already been canceled. Boston Mayor Marty Walsh is holding a press conference on the snowstorm. You can watch it in the player above. New York Gov. Andrew Cuomo is holding a press conference on the snowstorm. You can watch it in the player above. Seawater with chunks of ice has flooded an area outside Boston. Kathryn Burcham, a reporter with WFXT-TV, posted a video to Twitter showing flooding in Winthrop, which is just outside Massachusetts' capital. Buoys bobbed on top of the floodwaters, which came up to the wheel wells of a fire truck. The Boston Bruins home game against the Florida Panthers has been postponed because of the snowstorm battering New England. The Boston area could get as much as 18 inches of snow as well as high winds that could lead to power outages from the Thursday storm. The National Hockey League hasn't announced the date and time of the rescheduled game. Tickets for Thursday's game will be valid for the makeup game. The Bruins are in second place in the Atlantic Division after going 16-3-2 in their last 21 games. The Panthers had won five consecutive games before losing Tuesday in Minnesota. North Carolina authorities say a driver slid off a road in snowy conditions and overturned his vehicle, marking the state's third fatality attributed to a snowstorm sweeping the region. State Emergency Management spokesman Keith Acree says the man died in Beaufort County around 2 a.m. Thursday. The man's vehicle slid off the road into a ditch and overturned. Acree says the area had a lot of snow, and authorities determined it was a weather-related death. Acree identified the man as 29-year-old Joshua Wayne Biddle of Washington, North Carolina. The Highway Patrol had earlier reported that two men died in a weather-related crash in Moore County on Wednesday night. New York Mayor Bill de Blasio is expected to hold a press conference on the snowstorm soon. You can watch it in the player above. Flights have been temporarily suspended at New York's John F. Kennedy International Airport, the airport said on Twitter. The airport said it was experiencing whiteout conditions and strong winds. Travelers were urged to contact their carriers. Two deaths in North Carolina are being blamed on the East Coast snowstorm. Authorities say two men died during the winter storm Wednesday night when their pickup truck overturned into a creek. A spokesman for the state Highway Patrol says the truck came to rest on its top while submerged in the creek in Moore County, which is southwest of the Raleigh-Durham area. Sgt. Michael Baker identified those killed as the driver, 57-year-old Michael Alexander Wilson, and a passenger, 73-year-old Jerry David Wilson. Both were from Bear Creek. CBS News has confirmed that at least 13 people have died from the blast of winter weather and accompanying cold temperatures. Blizzard conditions are expected on the coast of New England, and residents are bracing for possible flooding and power outages as a result, CBS Boston reports. A blizzard warning has been issued from Cape Cod in Massachusetts to the Maine coast through 1 a.m. Friday. The town of Scituate, Massachusetts, is urging residents along the coastline to voluntarily evacuate. Officials are concerned that the ocean will flip large chunks of ice over seawalls and into homes as the storm intensifies. Many spent Wednesday boarding up windows, and crews did last-minute checks on the seawalls. The town has raised the height of most of them. A Massachusetts State Police trooper hanging out of a helicopter as it skimmed the frigid Merrimack River was able to pluck a man from the water in a last-ditch rescue effort. The Virginia Department of Transportation has more than 1,500 workers working 12-hour shifts with more than 1,400 pieces of equipment in response to the storm, CBS News correspondent Omar Villafranca reports from Norfolk. High winds are a major concern in the state. Bridges are at higher risk of freezing, and the Chesapeake area has over 90 of them. All of them have been sprayed with brine to keep them from becoming sheets of ice. In Norfolk, the city is under a blizzard warning for only the second time since the 1980s. All schools, city offices, libraries and courts are closed. Public transit isn't running. Snow that could pile as high as 18 inches in some spots of New England has begun falling. A light snow started falling in Connecticut, Rhode Island, Massachusetts and New Hampshire just before dawn Thursday. Snow is expected to increase after sunrise and peak during the late morning through the afternoon. Rain over Cape Cod and the Islands is likely to change over to snow in the afternoon. The storm is not just bringing snow but high winds with gusts as high as 75 mph in some spots, which could bring down power lines and cause power outages. There also is a risk of coastal flooding. Schools across the region are closed for the day, and governors are urging people to stay off the roads. Airlines canceled 2,944 flights Thursday out of 27,224 scheduled to, from and within the U.S., according to flight-tracking website FlightAware.com. Most impacted was Newark Liberty International Airport in New Jersey, which has 856 flights canceled (68 percent of those scheduled) and 9 flights delayed more than 15 minutes. Carriers have already scrapped 154 flights scheduled for Friday in the U.S. Some 77,000 homes and businesses reported losing electricity late Wednesday and early Thursday in Virginia, Georgia, South Carolina and Florida. Most were attributed to the storm. The lead meteorologist at CBS West Palm Beach, Florida affiliate WPEC-TV, Jeff Berardelli, says the storm will go down as one of the strongest non tropical cyclones ever along the Eastern Seaboard. Barometric pressure is forecast to drop near or below that of Superstorm Sandy. While 12-18-plus inches of snow on Long Island and eastern New England will be impressive, the cold behind the system will be even more impressive. Friday and Saturday morning will see the mercury at or below zero from New York City north, with wind chills of minus-20 degrees near New York City and minus-50 in the mountains of northern New England. Three cars of an Amtrak train heading from Miami to New York with 311 passengers on board derailed as the train tried to slowly back into the Savannah, Georgia station late Wednesday night, Amtrak tells CBS News. All three cars -- a baggage car and two sleeper cars -- stayed fully upright. There were no reports of injuries. CBS Savannah affiliate WTOC-TV says frozen switches on the tracks forced the crew to stop the train and put it into reverse. News footage from the site showed police and other emergency vehicles -- their lights flashing -- crunching over snowy, ice-shrouded roads near tracks where the cars had derailed. Workers in neon safety vests, their frosty breath rising in the bitter cold air, converged at the scene. The train was expected to continue north, with some of the sleeping car passengers being transferred to a different train. Snow is tracking across Virginia's Hampton Roads area and northern North Carolina, reported CBS affiliate WTKR-TV meteorologist Madeline Evans. Portions of the Outer Banks were only spot still seeing a mix of cold rain and some snow, and it will continue to transition into only snow overnight. Most of the area will see 8 inches to 10 inches of snow accumulation, with some spots possibly reaching a foot of snow, according to Evans. Snowfall will increase northward into portions of the Mid-Atlantic and northern New England early Thursday, according to the National Weather Service. Blizzard conditions are possible over eastern Long Island and portions of coastal New England, and also near the mouth of the Chesapeake Bay and Hampton Roads. Maryland Gov. Larry Hogan signed an executive order declaring a state of emergency for the shore areas, CBS Baltimore reports. Philadelphia city officials announced that a snow emergency goes into effect at 12:01 a.m. ET on Thu., Jan. 4. Managing Director Michael DiBerardinis says a snow emergency means all parked cars must be moved off snow emergency routes for plowing. Officials urge residents to park as far away from street corners as possible so that plows can easily turn. For more information, visit this website. Cars left on snow emergency routes will be moved to other parking spots to assist in snow plowing operations. If your car is moved, call 215-686-SNOW to find it. Do NOT call 911. CBS News has confirmed that nearly 35,000 people in the South are without power as a winter storm crosses the region. A look at websites monitoring outages show that Georgia is hit hardest with at least 17,000 customers affected. However, many of the outages predate the storm. American Airlines announced that more than 300 flights were canceled for Wednesday and more than 640 flights have already been canceled for Thursday. All depatures are canceled from Boston and Providence's airports, American Airlines said. There are scattered cancellations from Philadelphia, Washington D.C. and New York's airports. New York City is under a winter storm watch from late Wednesday through Thursday evening, CBS New York reports. A blizzard warning has been issued for Long Island's Suffolk County and some coastal New Jersey counties, but New York City is not affected. How much snow the city gets depends on the track of the storm. CBS New York forecaster Lonnie Quinn reported the North American Model expects the storm to track closer to the west, bringing 8.8 inches of accumulation. But the European Model, which tracks the storm 54 miles farther east, anticipates only 2.9 inches of accumulation for New York City. New York City's Department of Sanitation issued a snow alert starting at 6 p.m. Wednesday, meaning snow equipment will be ready to handle the winter weather. There will be a hard freeze overnight for many locations away from the immediate coast, CBS affiliate WJAX reports. Even the beaches will see a light freeze overnight. Highs will be in the mid to upper 40s Thursday and another hard freeze is expected Friday morning. In Tallahassee, the Suwannee County Sheriff's Office Division of Emergency Management will be opening as a warming station for people to escape the cold, CBS affiliate WCTV reports.